Protein shakes, “power” bars, and juice cleanses are all things that leave you with a weeks’ worth of vitamins in one bite, and without the calories of course. Calories are not worth all of the attention that they get, but they do get more than most vitamins. 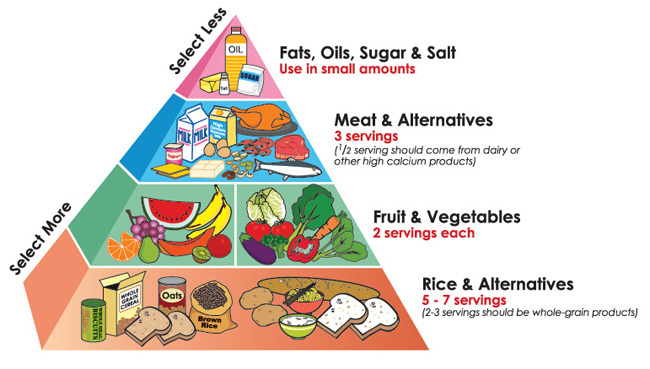 The Canada Food Guide has been blamed by many for the rise in obesity and heart disease among Canadians, as it has been almost 10 years since it has been updated. Opinions about healthy food have changed a lot, however, since 2007. Over doing it with meat, fish, and dairy products are to blame when talking about bad health. In America and Canada, putting a massive slice of meat on a plate with little or no vegetables or grains is apparently a meal for one person. The ideal rule for consuming meats and alternatives is 1-3 times per week for a young adult, according to a study conducted at Harvard. “It is key to find the difference between poor nutritional choices and good ones,” said Mr. Bryan Gee, a physical education teacher at Riverside Secondary. In a random and anonymous survey of some of the school’s students, it is apparent that the top three favourite snack foods are granola bars, crackers, and potato chips. All three of those items have one thing in common which is a high rate of salts, sugars, and fats. Looking at any other food guide than Canada’s, we see that fruits, vegetables, and starches are a few things that an individual is asked to consume more of on a daily basis. Dairy products and meats and alternatives are two things that we are asked to refrain from eating too often. An orange is jam-packed with vitamins, the most popular being vitamin C. It also includes Vitamin A, potassium, and even some calcium. Compare this to a serving of chicken, which some farming industries inject with toxic chemicals in order to make them grow faster and bigger while they’re alive. If there is one industry that has attracted a lot of attention, it’s the dairy industry. Milk has a much higher fat, cholesterol, sugar, and “calcium” content today than 20 years ago. Drinking milk is a personal choice, though some would say otherwise because technically you are drinking another animal’s baby food. It’s not that we should give up meat and dairy products entirely, but rather refrain from consuming them too often. One of the many things that the modern diet is heavily influenced by, is the media. News-flash: that one pill that will cure all of your aches, pains, and worries doesn’t exist. Consuming chemistry in the form of supplements or medications will not replace the benefits of real food, as human beings in their entirety are omnivores; we are designed to consume an equal amount of plants and proteins.